If you just bought the new iPad from Apple and your thinking about what a luxury it will be on your eleven-plus hour flight to Israel... think again! You might be able to pass the time on your overseas flight by catching up on movies and TV shows or reading a novel on your new iPad, but once you arrive in Israel your iPad will be confiscated by Israeli customs. 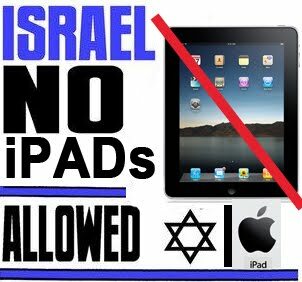 Bar Ben Ari and Zohar Blumenkrantz report in Haaretz that "the Communications Ministry has blocked the import of iPads to Israel, and the customs authority has been directed to confiscate them. The decision follows the refusal of the ministry's engineering staff to compromise on testing the device's suitability and compliance with Israeli wireless networks. It seems however that the engineers made their decision without notifying Communications Minister Moshe Kahlon in advance - and caused an uproar within the ministry. For now, the ministry has not given the device categorical approval required for wireless devices; and ministry officials say its wireless technology is not compatible with Israeli standards." Israel's Communications Ministry has requested the relevant information from Apple's Israeli distributor, iDigital, so that iPads can be cleared for import into Israel. The head of customs at Israel's Ben-Gurion International Airport in Lod claims that they have confiscated ten Apple iPads so far. Until further notice, I'd recommend leaving your iPad at home when traveling to Israel.